A yellowish-green dense gas with a choking smell. It is very poisonous and was used as a weapon during the First World War. The gas is made on a large scale from salt (sodium chloride) and is used in the manufacture of bleach and PVC plastic, and to purify drinking water and to disinfect swimming pools. Our daily intake is about 6 grams, mainly as salt, but we could manage with half this amount. 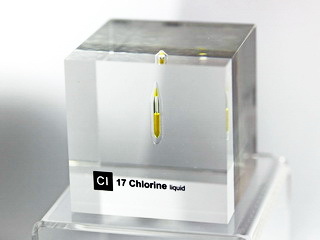 Chlorine Explosion in 80mm Acrylic cube - breathtaking ! !